Wayne County is the most populous county in the U.S. state of Michigan. As of 2017, the United States Census estimated its population as 1,753,616 making it the 19th-most populous county in the United States. The county seat is Detroit, the largest and most populous city in Michigan and 18th-most populous city in the United States. The county was founded in 1796 and organized in 1815. 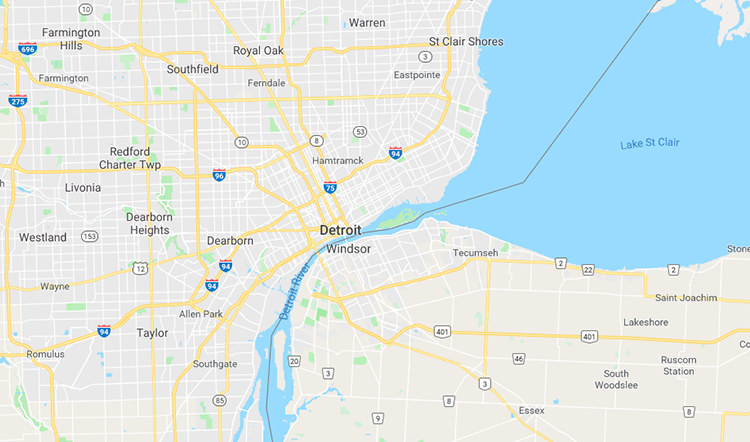 Wayne County is included in the Detroit-Warren-Dearborn, MI Metropolitan Statistical Area. It is one of several U.S. counties named after Revolutionary War-era general Anthony Wayne. According to the U.S. Census Bureau, the county has a total area of 673 square miles (1,740 km²), of which 612 square miles (1,590 km²) is land and 61 square miles (160 km²) (9.0%) is water. Its water area includes parts of the Detroit River and Lake St. Clair. The 2010 United States Census indicates Wayne County had a 2010 population of 1,820,584. This is a decrease of 240,578 people from the 2000 United States Census. Overall, the county had a -11.7% growth rate during this ten-year period. In 2010 there were 702,749 households and 450,651 families in the county. The population density was 2,974.4 per square mile (1,148.4 square kilometers). There were 821,693 housing units at an average density of 1,342.5 per square mile (518.3 square kilometers). 52.3% were White, 40.5% Black or African American, 2.5% Asian, 0.4% Native American, 0.8% of some other race and 2.4% of two or more races. 5.2% were Hispanic or Latino (of any race). 7.5% were of German, 6.8% Polish and 5.2% Irish ancestry.